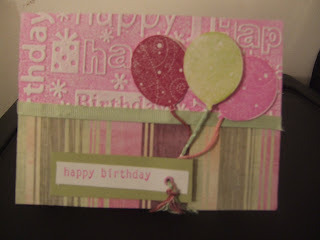 First I want to say that I cased the basic card idea from Virgo5 on SplitCoastStampers (click for her card). On SplitCoast Stampers they had a technique where you ink up the negative part of your cuttlebug embossing folder (that's the side with the cuttlebug logo on it) and I love the look. To check out the full instructions go to Split Coast Stampers . My card looks more colorful in person then in the picture. Inks: SU Pixie Pink (on the one balloon ,on the embossing folder, and on the Happy Birthday saying), SU Purely Pomegrantate, the green is from a Color Box Ink wheel (non SU). Other accessories: balloon ribbons are floss (they matched well), Pattern paper is Sandylion Wide Stripes, Green cardstock non SU, eyelet non SU, Cuttlebug Happy Birthday Embossing Folder, SU Certainly Celery ribbon. Beautiful card!! Thanks for sharing the technique, I hadn't seen this one before. Now I've got one more reason to love my Cuttlebug! Beautiful job with this challenge!!! I also really enjoyed that one!!! It gives such a different look!! This card is just so lovely with the colors you used too!! BEAUTIFUL! !=] I luv the background n how it cums out! Awesome job! I love that technique. I'm going to have to give it a whirl!